FINANCIAL CONTRIBUTIONS: FULL Membership association or organization shall pay to the Federation fifty Euros (€ 50.00) annually as membership dues. Members of the Executive Council shall pay five Euros (€ 5.00) monthly. Affiliate members will be mandated to contribute to Federation as requested by the Executive Council. The committees will submit a plan of action for approval to commence work immediately. JULY 26th, 2015 CELEBRATIONS: The conference agreed that countries wishing to host the July 26 celebrations should put such request in writing. Norway, England, Germany and the Netherlands have expressed interests in hosting the event. ADVOCACY: The conference reaffirmed EFLA commitment to advocacy role in Liberia and will continue to comment on various situations unfolding in Liberia and the Diaspora of interest. EFLA LIBERIA / USA: The conference endorsed the establishment of an office to represent EFLA in the USA with Mr. James Rogers as our Special Representative. Also, The Office of Special Representative in Liberia will continue to function under Ms Roberta Roberts. EFLA HISTORY: It was agreed that early leaders and officials of EFLA will be contacted give an account of where the organization began and some of the successes and challenges it has faced for future documentation and reference. EBOLA FIGHT: Liberian communities across Europe were applauded by the conference for the tremendous efforts in the fight against Ebola through their financial contributions, donation of medical and relief supplies as well as series of fundraising events and awareness marches throughout European cities creating awareness about the situation in Liberia prompting intervention by citizens and governments in Europe. EBOLA CONFERENCES –USA & LONDON: The conference approved EFLA partnership and attendance in the two conferences on Ebola held in Washington DC, USA and London on December 5th 2014 respectively. Mr. Ebenezer Akoi of Norway represented EFLA at the Washington DC Conference. The aim of both conferences was to network and find ways in which the Diaspora can compliment international efforts to defeat Ebola. OTHER MATTERS: The conference noted that more needed to be done to bring about unity and cohesion within the Federation and EFLA should play more leadership role in resolving problems within member organizations as well as reaching out further to attract more membership. 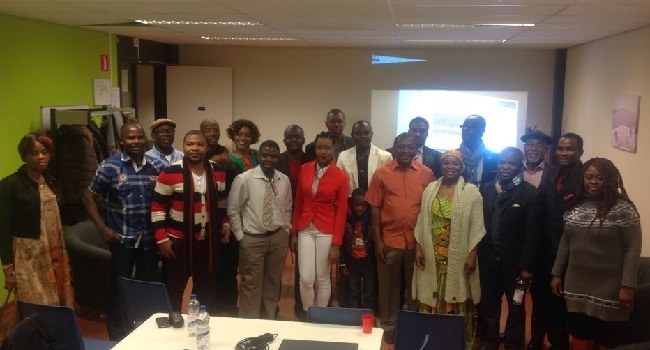 In so doing, a brief meeting was held with members of Concerned Liberians, Liberians in Holland and Mr. Nicholas Doe, a senior member of the community to find means of uniting all Liberians in Holland. We agreed that Concerned Liberians will take the lead to call a meeting of the entire community and keep everyone informed as to the outcome of the deliberations and not a select few. Done this 29th Day of November 2014 in the city of Utrecht, Netherlands and unanimously approved at the conference by a vote taken.